Alex Ellsworth is a media composer, producer and artist living in Los Angeles, bringing a new perspective to the term, Rockstar. He has been described by colleagues as “smiling 25/7” and is known to bring that energy into all of his collaborations. Alex is challenging the boundaries of songwriting and producing with his unique, creative outlook and ability to tell stories through music. 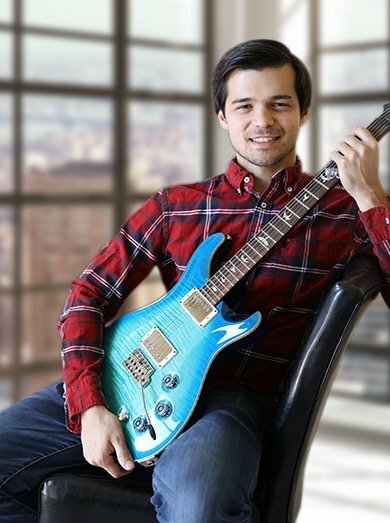 Raised in Singapore, Alex comes from a family of music lovers; and after seeing the movie “School of Rock,” he became inspired to begin a musical career of his own. He spent long hours practicing every day as his passion and love for music turned into his reality. Alex began to tour internationally with several bands, playing concerts in Singapore, Indonesia and the Philippines. From there, Alex moved to Los Angeles, California to truly pursue his dream of a career in music. It was in college when he took a class in Film Scoring, taught by Adam Schoenberg, that he discovered his real love for story-telling with music. Since then, Alex has gone on to score over 30 films and TV shows. He currently assists several industry veteran composers (Megan Cavallari, Darius Holbert), and can be found on a number of different music libraries and TV networks, including TFC & Lifestyle Network. Alex has worked on multiple award-winning films, including his most recent, “Escape,” which came in second place in a 24-Hour Film Festival challenge, as well as taking other awards. He currently has several ongoing projects which include an ongoing talkshow series, a dramedy film and a cinematic-virtual reality experience, and is always looking for new projects to collaborate on. He also offers custom recording and vocal tuning sessions for album artists to suit the needs of their musical vision. When Alex isn’t in the studio, you can most likely find him adventuring out with good friends enjoying delicious Asian cuisine. He enjoys meeting new people and making genuine connections. If you are interested in working with Alex, please contact him now.